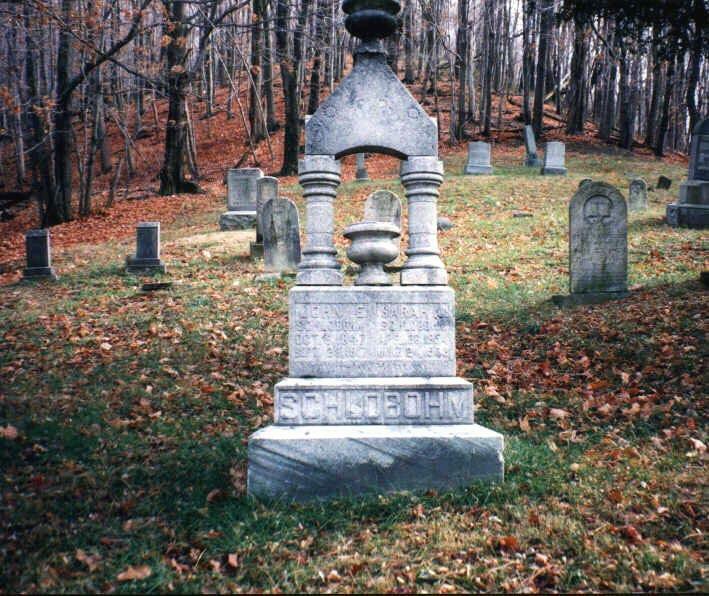 This cemetery is located off Rt 7 and on Rt 8 known as Low Gap Road at Hill Top. Anderson, James Jan 1861 s/o E.E. & S.
Anderson, Infant s/o E.E. & S.
Anderson, Carley G. 22 Mar 1900 1 Feb 1907 s/o C.D. & M.A. Anderson, Haddie 11 Nov 1901 11 Dec 1901 d/o L.C. & E.
Bell, William 18 Mar 1899 29 Jun 1899 s/o D.M. & P.
Berry, Lola Ann 6 Sep 1891 16 Jan 1898 d/o H.J. Cane, Hattie J. 21 Mar 1871 ---- w/o D.W.
Church, Josiah F. 24 Jan 1892 6 Jan 1895 s/o George & L.
Cox, Russell G. 1892 1897 s/o S. & E.A. Cumberledge, Dolen, Martha B. 7 Nov 1880 22 Aug 1903 w/o R.F. Hostutler, Armstrong J. 30 Mar 1902 14 May 1902 s/o C.J. & M.B. Jackson, Infant 1 Sep 1899 1 Sep 1899 s/o W. & A.L. Jackson, Catherine 1832 1917 w/o F.
Jackson, E.J. 16 Sep 1867 1 Jan 1887 d/o F.
Jackson, Rebecca C. 30 Sep 1871 2 Dec 1890 d/o C.P. & E.J. Kirkpatrick, James 20 Jul 1869 7 Jan 1899 s/o R.A. & C.
Lancaster, Ivan C. 1907 1913 s/o W.S. & W.P. McLaughlin, Fay 22 Mar 1917 9 Sep 1919 s/o F.P. & S.B. McLaughlin, Infant 1907 s.o F.P. & S.B. Moore, Erastus W. 9 Mar 1875 s/o A.G. & N.
Moore, Marie E. 4 Apr 1892 4 Apr 1892 d/o E.E. & E. G.
Morris, James H. 12 Jun 1858 s/o W.F. & H.
Porter, T.L. 10 Oct 1893 4 Jan 1894 s/o Wm & A.V. Porter, D.W. 10 Oct 1893 26 Nov 1893 s/o Wm & A.V. Sapp, J. Clark 23 Jun 1879 21 Feb 1913 s/o A. & M.E. Sapp, Trella M. 19 Apr 1891 22 Nov 1893 d/o A. & M.E. Sapp, Archie R. Sep 1894 Sep 1894 s/o J. & M.
Sapp, Leonie 7 Jul 1836 d/o J. & M.
Shuman, Nora P. 5 Jul 1894 23 Sep 1898 d/o A.T. & L.G. Shuman, Infant 11 May 1893 11 May 1893 s/o A.T. & L.G. Shuman, Pearl D. 2 Apr 1902 17 Jan 1904 d/o A.T. & L.G. Shuman, Thomas 5 Dec 1905 19 Sep 1906 s/o A.T. & L.G. Stansberry, Virginia A. 29 Mar 1846 3 Jul 1876 w/o F.